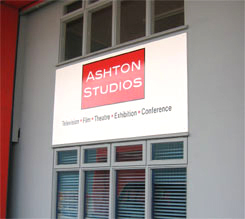 Ashton Studios is a Television, Film and Theatre and Conference contractor specialising in design and construction of a wide variety of productions both at home and overseas. Situated in Glasgow Media Park within a mile from the city centre. We have our own fully equipped workshops, design and construction areas and graphic studio offering unparalleled skills and facilities to meet the growing needs of the industry. From initial concept through design and manufacture, we draw on the talents of a wide range of skilled joiners, painters, metal workers and graphic designers whose experience and technical craftsmanship play a vital role in the company's continuing success.